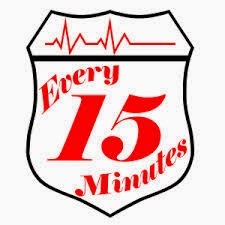 Yesterday at my high school was our "Every 15 Minute" Event, which is a "live action" display of the statistic that every 15 minutes someone dies from a decision to drive under the influence of drugs or alcohol. The police department came to our school and coordinated the efforts of the students throughout the day. A very large police officer played the Grim Reaper and he and his growing band of ghosts, went through the school and students succumbed to their imaginary deaths. Ghost-like make-up was then applied and they then joined the band of hall wandering ghosts that we inhabiting the halls. Students took their "jobs" seriously, while finding joy in their community time together. At the end of the day, all 23 students gathered in the auditorium to practice their "play" which would be performed, in front of their peers, today at an assembly. Even when overnight plans changed and we ended up sleeping at the high school, they took their roles seriously, knowing how important the message is to their peers. The whole night was not hard work, we also went to see a movie, laughed, and cried. The evening was a success overall. A quick sleep at the high school and we prepared for the big presentation. An incredible slideshow laid the foundation for the seriousness of the presentation. It began lighthearted then progressed into more serious. Their incredible performance left students quiet and pensive. There were tears shed by adults and students alike. It was a powerful message overall. I am so pleased that I have gotten to be a part of this incredible event and look forward to spearheading it for future years. I think the greatest part of it all is the reminder of how important the teachable moments are...how powerful the message is to be heard. Whether the message is one that is life changing or simple, we must keep an eye out for these moments to make a difference...these small but powerful teachable moments!